I am late to the patch game, so to speak. I have been drooling over any and all elbow patch tops, sweaters, jackets and cardigans for at least a year now. I could never find one online or in stores that wasn't too pricey or fit right...until now. This cardigan from Avery Lane Boutique was a match made in heaven. It fits like a glove and can be mixed and matched with so many pieces I already own. The fabric is soft, lightweight and will carry me into the spring season. I am wearing a medium and it gave me just enough room to layer a top underneath without the sleeves being too tight. I must mention that I randomly, yeah right, popped into Forever 21 to do little scouring of their clearance section, all additional 30% off the clearance prices, and came across the very last buffalo plaid scarf they had in the store. It's not online, but I found an option for you. It's a men's scarf, but I have worn one of Ross's scarves before and there is ZERO difference between men vs. women. Buffalo plaid is probably one of the biggest trends going down at the moment and anything you find in it will be gone before you can blink. So, if you are in the market for a scarf like this, grab it now because tomorrow it will most likely be gone. Today, Avery Lane Boutique, has so graciously offered one lucky lady to win a $40 shop credit to their store...plenty to help you grab this elbow patch cardigan I am wearing today. They sold out of it once, so don't wait too long to purchase. If you would like to shop now, get 20% off your order by using the code shanna20 at checkout. 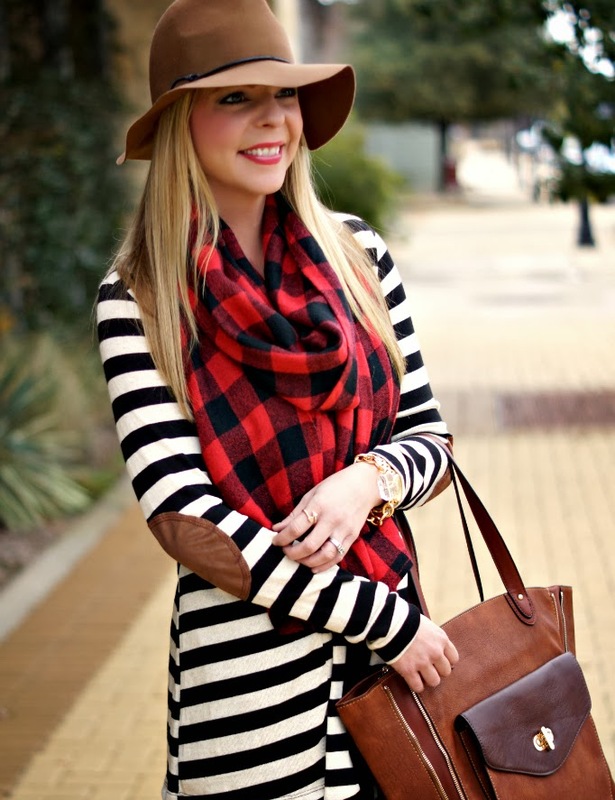 Love that you paired the stripes with the checked scarf! I'm heading to look at their site now! I think I need to stop by F21 at lunch tomorrow. You already know I need this scarf. Love this cardi - the elbow patch is so fun! 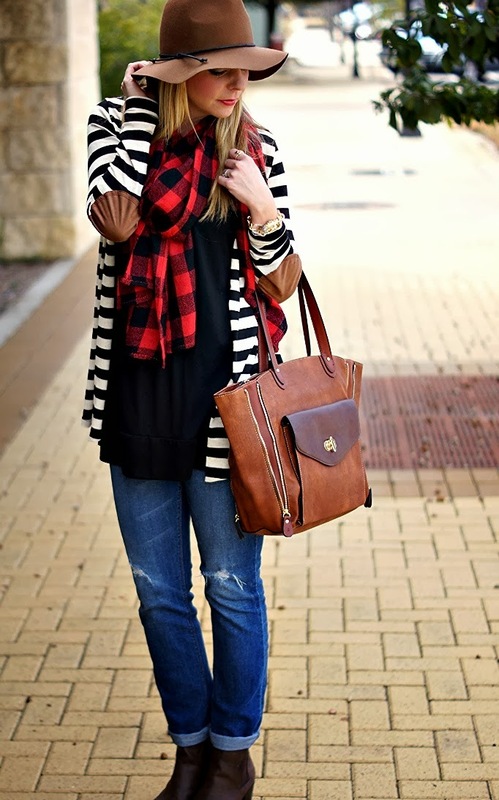 Love the mix of plaid and stripes, you look gorgeous lady. 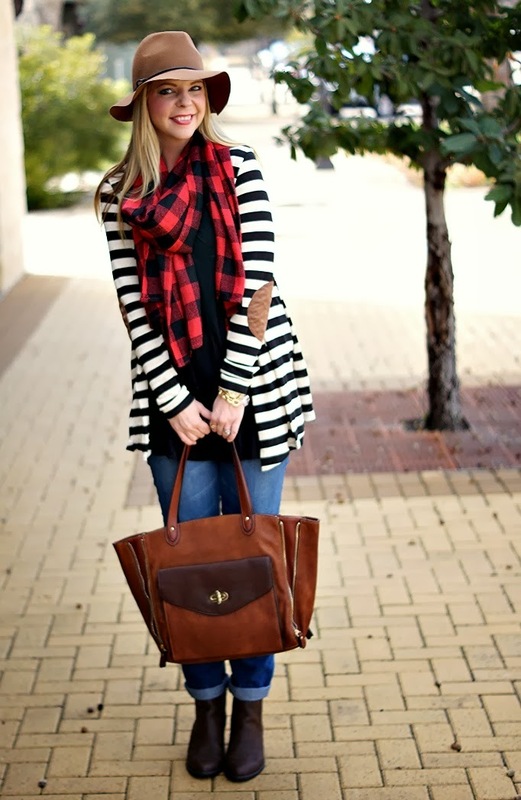 LOVE that striped cardigan, and I love how you styled it! Such adorable print mixing here - and I own that same hat but have yet to wear mine! 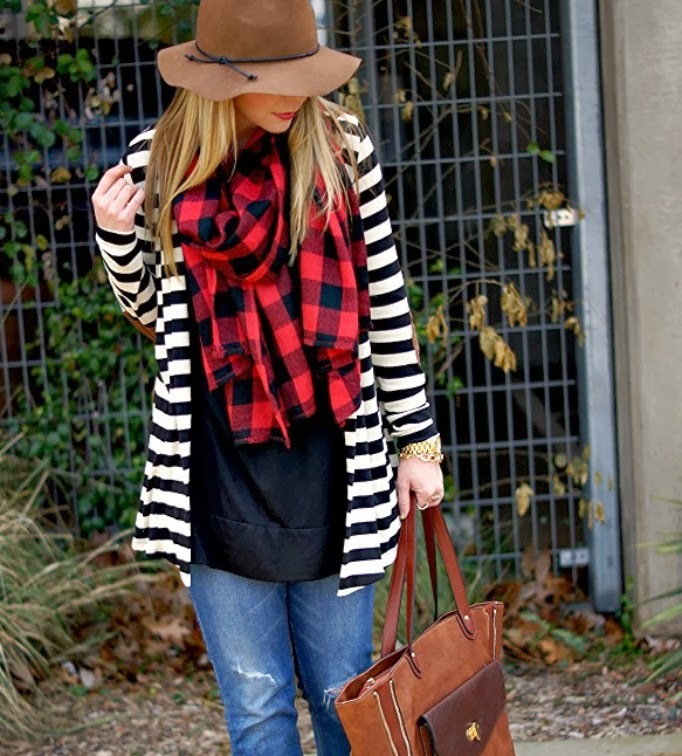 I just LOVE this cardigan and how you styled it! SO ADORABLE!! Shanna, I LOVE this! What a perfect cardigan and I love it with the scarf. I adore Avery Lane Boutique, they have the best stuff! I love love love this look on you!!! I think it's quite a travesty that I do not own a single item with elbow patches! I need to fix this STAT! That cardigan is absolutely adorable. Without fail, I will ALWAYS buy a sweater if it has elbow patches. I'm a sucker for them! Your hat matches perfectly with the patches on the sweater. Love it! 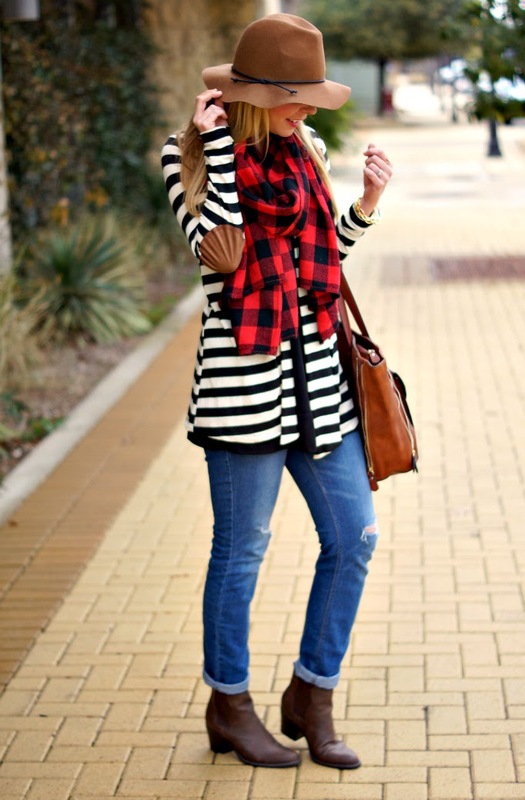 I love the mix of stripes and plaid, too cute! Have a great weekend, Shanna! F21 I always LOVE their stuff and never have the patience to shop there. I only get to visit them when I'm out of town. I WISH my mall had one. Last time I went was at Christmas - I walked in, walked around, looked at two things and then my head goes into sensory overload with all the stuff to see and touch! I used to have MUCH more patience - your scarves are making me change my mind. This one and your other F21 scarf I am obsessed with - I hate they are both sold out!! Thanks for all the fun options. Thanks for the giveaway chance!!!! I love this...as usual. The pattern mixing is perfect. :) Of course, the are already sold out of mediums! Ugh! Awww you're finally in the patch bandwagon Shanna....I think I will never get in hahaha. That's a very pretty yet functional cardigan & the mix of patterns is just so awesome!! I never think to wear stuff like this together, you always inspire! I am so loving this outfit, especially the hat. You look so adorable! Love the elbow patch cardigan too. You are gorgeous! I love this!! I have been wanting something with elbow patches for a very long time and just can't find anything I absolutely love yet. I love how this is striped with elbow patches... so cute, Shanna! You are so great at mixing patterns! Love this look and that hat is one of my favorites!! I always want things with elbow patches. I think it's so cute. Elbow patches are always fun! 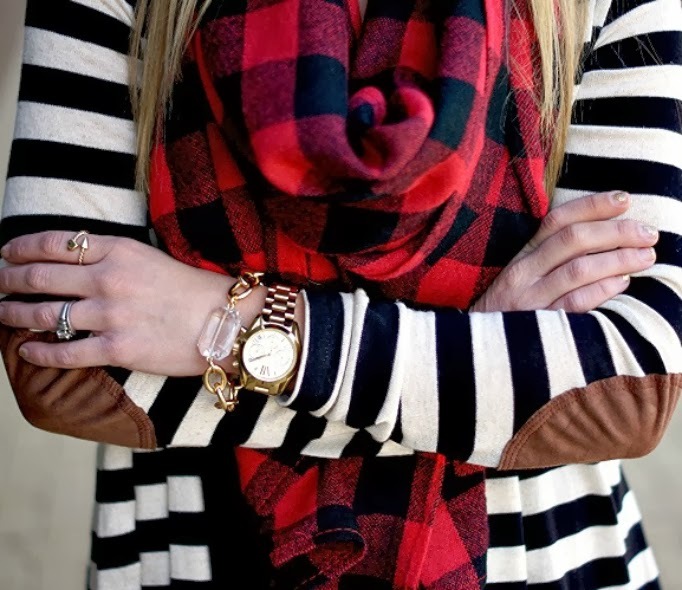 And I'm loving the stripes mixed with the plaid scarf! SO cute, always, lady! So adorable Shanna!! Love that cardigan. I am obsessed with all things with elbow patches. And the plaid scarf looks perfect with it! Have a great weekend! Love the cardigan! Does it have buttons or any type of closure? Love your look! So fun and stylish! I love that sweater! And your bag! Cute look! I'm still hunting for the perfect elbow patch sweater! 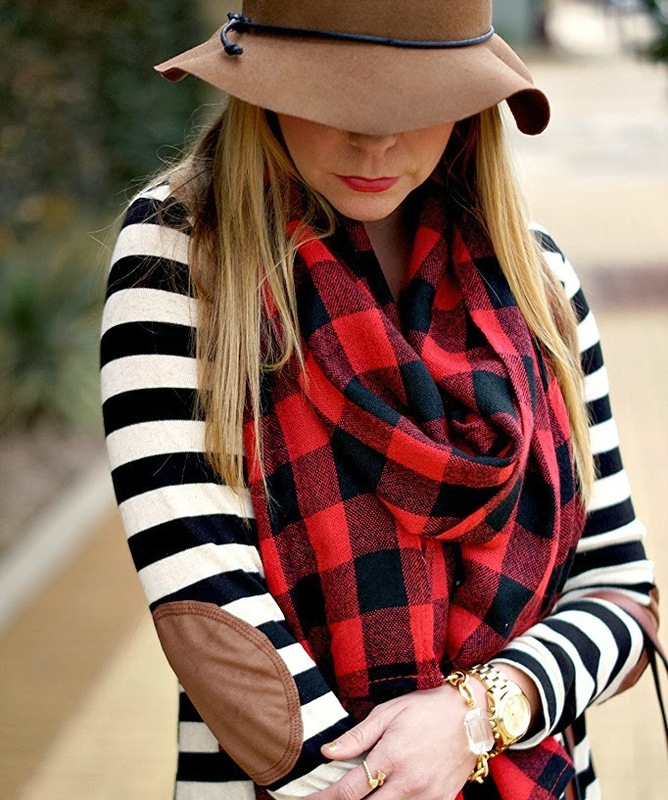 Love this one, and it looks great with the buffalo check scarf! You have such great style! I love the red ad black plaid with the white and black stripes...genius!! I love your blog and looking at all the outfits you put together. They definitely inspire and add something I might not have thought of before to my "sense of style"!! Cute scarf and I love the patches. I adore the patches! Pinterest convinced me to add some leather patches to an existing sweater… so we shall see how that turns out! ha! Crazy in love! Wonderful color and pattern mixing, it looks great! Love your bag! I agree, finding the right patched arms is a difficult task! I haven't been able to find anything that suits my arm length + the way I like my tops to fit. Oh well, I'll keep searching. Absolutely love the cardigan! Great styling girl! Love your blog! We just found it and can't wait to follow along!